It was one of my oldest recipes, for a showstopping cranberry salad, and salad means I wouldn’t need a kitchen to make it! You can see in the bottom right corner that it was printed from allrecipes.com in 2003. I thought it would be fun to show you how many times I’ve scribbled on it (I whited-out the parts where I scribbled phone numbers and e-mail addresses) , making changes here and there. 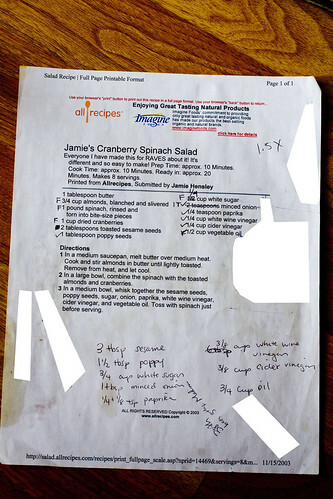 Looking back, before this blog, I used to save printed recipes in a 3 ring binder, organized with dividers: salads, hot appetizers, seafood, meat, etc. I’d work on recipes and edit them with pen and paper. That all seems so archaic now yet it wasn’t that long ago. If you compare the recipe I’m giving you today and the one I originally tried, it is quite different. I’ve also given options in the ingredients because I’ve substituted at times when I didn’t have certain ingredients and many versions work equally well. Every time I’ve made it, whether slivered almonds or sliced, a mesculan base or bed of baby spinach, I’ve gotten loads of compliments. 1. In a small bowl or cup, whisk together olive oil, vinegars, sugar, shallot or onion, and paprika. 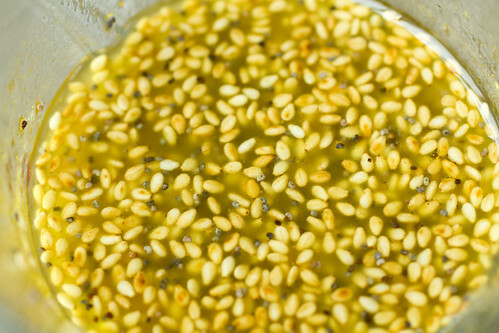 Stir in toasted sesame seeds and poppy seeds and whisk until thickened. 2. 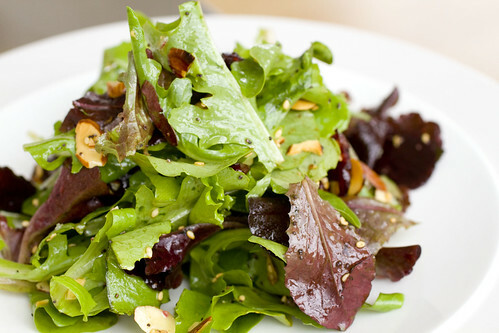 In a large serving bowl, toss together greens, cranberries, and almonds. Right before serving, season with salt and pepper, and dress. Toss to coat and serve. posted by jessica	at 11:32 AM	Filed under American, Recipes. You can follow any responses to this entry through the RSS 2.0 feed. Both comments and pings are currently closed. This is one of my favorites, Jess! 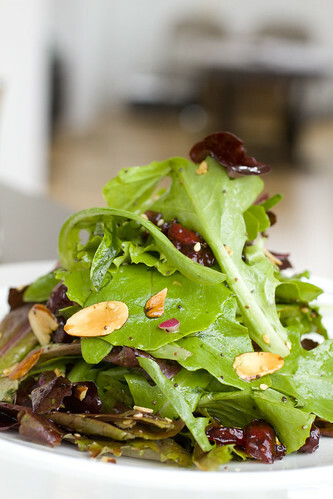 Excellent salad, I like the cranberries and the almonds combo! Congratulations on the move! This looks like a superb salad, I think! 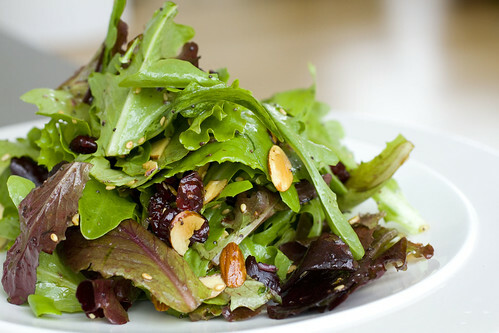 i almost always sprinkle in some nuts and dried cranberries when i make a salad–they add so much! i think the dressing for your lovely salad sounds delicious–paprika!?!?! Grace, I always have nuts and dried cranberries on hand and it is such a life-saver for salads in the winter, when there isn’t much else that looks great. The paprika doesn’t stand out, but it works. Sandra, this salad would be perfect for roast pork loin! Ooh lucky! You’re getting a kitchen built??? This salad looks nice and simple. I love salads with multiple dimensions both in terms of flavors and textures. Sounds like a lovely dressing and salad! Jen, yup, we’re in final design phase, will share soon! Glad you’ve made it! Lots of culture there! Love the salad & the recipe, I have to confess I still keep my recipes in a ring binder lol really because I enjoy the photo’s. Old habits die hard hey? Les, I haven’t added anything to my binders in years since everything goes on the blog, but I can’t bare to throw it out.